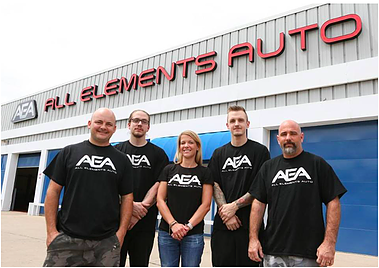 All Elements Auto and Marine was established to create a one stop shop for consumers who have a passion for customizing their vehicles or boats. We offer FULL automotive service, repair and customization in addition to many other auto, marine, ATV, motorcycle, golf or recreational vehicle accessories. We customize and install audio, back-up cameras, alarms and remote starts, DVD/Entertainment packages, LED lighting, aftermarket seats and roof racks plus window tinting and paint protection film. We are wheel and tire specialists and our list of brands is too extensive to list. We have a LIFETIME warranty on all of our installation and stand behind it 100%. We are also a Nautique Boat Dealer with new and used boat sales, service and repair work done in house by PCM certified technicians. We have a fully stocked pro shop with everything you need to have a great time on the water! • The assistance of a capable and knowledgeable sales consultant. • Advertising and representations that are truthful and factual. • A written disclosure of all details associated with a purchase. • An explanation of the proper usage and operation of products. • Products properly prepared, inspected and tested before delivery. • The delivery of new products as scheduled. • An explanation of all maintenance requirements and schedules established for your product. • An explanation and written copies of warranties on all products and major components. • the explanation of maintenance/repair plans including estimated repair time and cost. • An itemized list of all charges with thorough explanation. • Prior approval of changes in repair costs or additional charges should they occur. • Maintenance/repair work done right the first time by knowledgeable trained technicians. • Maintenance/repair work completed when promised. • Timely notice of changes in service delivery time if delays are experienced in repair completion. • Inspection of any replaced/damaged components upon presentation of the invoice/work order. • Fair, open and honest treatment without discrimination. • Respectful, professional and accurate responses to all your product questions and requests. • Privacy and confidentiality of customer records. Got my remote start installed today. Fast, knowledgeable, and very professional. Even offered to stay late so I can pick up my car after work. Would recommend them for your vehicle needs. The guys opening this new shop have always done great work on everything from boats to electronics. Can’t wait to see the new place. Great new shop, same great quality. Truly a class act company that does top notch work at a very reasonable price. They went well above and beyond my expectations. Thank you guys, it was so refreshing to not have someone trying to take advantage of you like some of the other shops I have been to over the years. I received excellent service for a stereo instillation and steering wheel interface so the controls on my steering wheel still work. I carried in the parts and they immediately installed them. No waiting. Thank you for awesome service , I will definitely recommend to my friends. Thanks again for the dope tint job on the ol XJ! Couldn’t of asked for a better job. Best work in town for sure. Very knowledgeable on tough stuff. And had what I needed on the shelf.